[Local Growth: Realising every place’s potential, HMG, October 2010]. The South East Local Enterprise Partnership is powerful in terms of scale and ambition and local in terms of operation. We will use the scale of our LEP to maximise private, public and community investment. In doing so, we will build strongly on plans developed with local business experience and market knowledge across our functional economic areas to deliver and target growth. Local Enterprise Partnerships (LEPs) bring together businesses, councils, universities and other industry players to form partnerships whose geography properly reflects the natural economic areas of England. LEPs understand their economy and are directly accountable to local people and local businesses. They decide what the priorities should be for investment in roads, buildings, and facilities in the area as part of an integrated approach to growth and infrastructure delivery. LEPs represent a major step forward in fostering a strong environment for business growth. The South East LEP works with its partners to pursue and attract major investment in to the SELEP area to deliver significant economic growth. We will inject almost half a billion pounds worth of Government investment into the area through its Growth Deal. The Deal will see at least £84.1 million invested in the SELEP area in 2015-16, supporting the delivery of up to 35,000 jobs and 18,000 new homes and over £100 million in private investment over the period to 2021. SELEP is a genuine ‘coalition for growth’ between business, government and education. We will put the role of enterprise – as the driving motor of the economy – at the heart of everything we do; and we will work in partnership with central government and its key agencies. Stretching along the coast from Harwich, through Ramsgate and Dover all the way to Peacehaven, the market towns, small cities, coastal communities, and villages of the South East LEP area offer an exceptionally diverse choice of places to live and work. 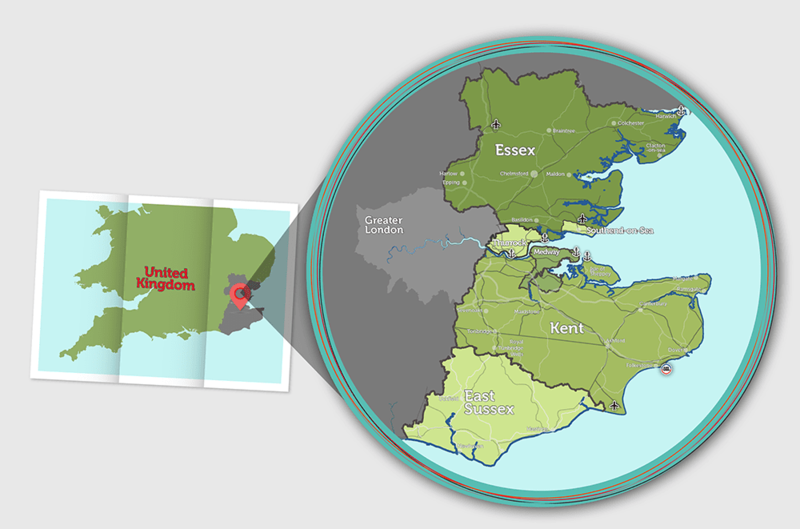 SELEP covers an area encompassing the local authority areas of East Sussex, Essex, Kent, Medway, Southend and Thurrock. With eight ports, high speed rail links, and national and regional airport capacity, we are the most significant economic gateway and strategic route between mainland Europe, London, the rest of the country with access to global destinations. We are also home to eight major universities with internationally renowned research and teaching strengths. Take a look at an overview of the themes of our work here. Copyright © 2019 South East LEP (South East Local Enterprise Partnership). All Rights Reserved. Website by Pillory Barn.